There’s a curious series of events that happen when Moshe and Aaron appear before Pharaoh and begin to display the signs and wonders of Hashem to him and his court. The first thing they do is provide him a sign of their authority from Hashem by turning Aaron’s staff into a serpent. However, Pharaoh’s magicians also turn their staffs into serpents as well. And after Hashem turns the water of Egypt into blood, the magicians of Egypt replicate this miracle as well. 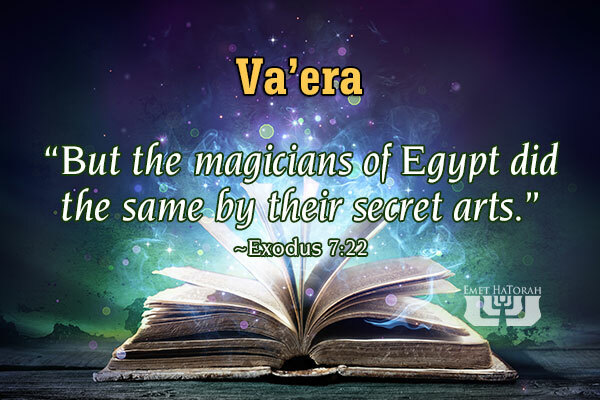 It says, “But the magicians of Egypt did the same by their secret arts” (Exodus 7:22). Throughout the course of Hashem displaying the various miracles, signs and wonders (ancient Hebrew for “shock and awe”) on Egypt, Pharaoh’s magicians periodically replicate these signs. Why? In order to convince Pharaoh that the God of the Hebrews was no more powerful than they were, and thus allow his heart to be hardened against the Children of Israel. Why would anyone want to bring straw to peddle in a town known for its straw? A person that would have the audacity to do such a thing had better know beyond a shadow of a doubt that his product was ultimately superior to that which was produced in Straw Town. Otherwise he would suffer the humility that would follow. In other words, Pharaoh and his magicians were telling Moshe and Aaron, “Why are you peddling your magic here in the capital of magic? We know magic when we see it, and the only way we are going to pay attention to you is if your magic is of a far superior quality than our own.” Moshe and Aaron had more than magic, but Pharaoh and his magicians didn’t know that. For a long while they only saw Moshe and Aaron trying to compete with the magic of Egypt. Only in the end did they realize the difference between their own product and what these two Hebrews were bringing to Egypt. They thought they had power. But when the God of the Hebrews poured out His signs and wonders upon the land of Egypt, they realized anything they could do was only smoke and mirrors compared to His power. We must bring straw into Straw Town. We must offer a better quality of product. We can look at this in two ways. First, we need to be able to bring the message of the Torah and the Good News of our Messiah to the world in an authentic manner. For example: We commonly hear people giving a secular or humanistic interpretation or examination of Scripture. It ranges from Hollywood to our Presidents to the History Channel to our next door neighbor. However, they need to hear an authentic interpretation that is built on spirituality and truth. Peter tells us that we must “always being prepared to make a defense to anyone who asks you for a reason for the hope that is in you; yet do it with gentleness and respect” (1 Peter 3:15). We need to be able to have an answer for the “problematic verses” others claim to be in the Word of God, and do it with gentleness and respect. Second, a strong segment of the Church knows the Scriptures forwards and backwards. But they don’t understand them in their proper context, and therefore the result of their interpretations is that Scripture ends up contradicting itself. In this respect, we need to bring “straw to Straw Town” by sharing clear and definitive interpretations of the Holy Scriptures with our brothers and sisters in Yeshua that do not have the same end result. The Torah has not been abolished. The commandments have not been set aside (even the “ceremonial” ones). Neither has God’s covenant with Israel. Nor His covenant with the Aaronic priesthood. As we know, these are merely misunderstandings of the Scriptures that have been perpetuated over many centuries. But they have the force of longevity behind them. Because they have existed for so long, they have the weight of truth in the minds of most Believers. The only way to overcome these misunderstandings is to be able to present our case in a clear, understandable manner, seasoned with a heavy dose of gentleness, patience, humility, and respect. You’ve got the straw that Straw Town needs. Are you brave enough to share it with them?